The Bird Bellows ball joint family has been engineered as the low cost reduced-envelope solution to duct articulation needs in lower pressure aircraft ducting system applications. These ball joints are bellows sealed for leak free service with maximum reliability, and engineered for lowest possible bending moments. 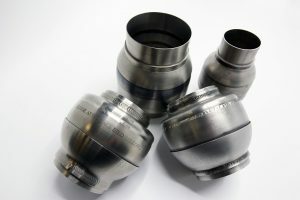 Available in CRES, titanium or nickel alloys as an alternative to the gimbal joint for low pressure applications.